Ruminations: I finally got The Joke. A few days ago, I threw out a joke about sponsoring cats. It was a parody of the old Sally Struthers sponsor-a-child-in-Africa charity drive. What I didn't expect was that people would actually want to sponsor a cat. "Their" cat. In my home. A cat which they cannot love, pet, cuddle or hold. A cat which they can enjoy only vicariously, from afar, through the photos that they'd expect to receive. And yet, I got several takers. My reaction was a resounding "WTF!" I wrote a blog post, and told my son about it. His reaction was, "what's wrong with that?" The husband of an online friend thought likewise. And I realized that the world has literally gone mad. It's not people's willingness to pay for my cats' food that floors me... it's that absurdity has been normalized. It's as if this isn't the universe I was born in. It's as if I'm caught in some sort of "Flashpoint" where a new universe spins off with every joke I tell. It's absurd, but it would explain why every single parody product I've ever imagined (and there are dozens of them) is now actually sold as a serious product. Given my experience, I'm debating whether I should be holding on to this "Flashpoint" joke on the slim possibility that it isn't a joke. It's now my conviction that Poe's Law is mis-stated. It's not that a parody of extreme views is indistinguishable from the views themselves; it's that extreme views cannot be parodied, because the views cannot be made more ridiculous than they already are. The best you can do is faithfully re-state the views and let the audience decide which side of the theater they're going to sit in. 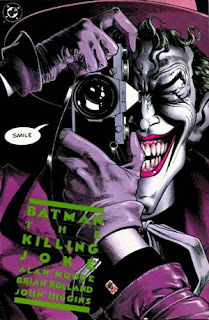 For decades, the Joker has teased Batman with the idea that there is some "joke" that motivates his murderous rampage. Whatever it is, it's hilarious, but he's never actually stated it, not even in "The Killing Joke". Every other character concludes that he's batshit crazy, a chaotic element; and they lock him up in an insane asylum, melt down the key to slag, and pray to God in Heaven that he doesn't escape... again. But now I know the Joke. And it's funny. Not only that, it makes the Joker the sanest person in the DC Universe... or this one, for that matter. The Joker isn't a murderous psychopath. He never has been. He's a parody of one. BTW, if you haven't figured it out, this is a joke. Without a disclaimer, I'm pretty sure this post will put me on somebody's watchlist. Hell, it might happen with a disclaimer. But to the extent that it's a serious explanation for the Joker's motivation... think about it. Before writing this down, I told this to one of my sons. He said, "Dad... you're really scaring me." So I added a disclaimer. But it IS my "in-Universe" theory that the Joker himself THINKS he's sane, and that he's exactly what he says he is... a performance artist. If you consider it in context... that is, in the context of a comic-book world where absurdity rules the day.. where people fly around in spandex tights and nonsense stands in for science... it makes a kind of "comic-book" sense. And I wonder what would happen if anyone in that Universe ever "got" the Joke. If someone simply stood up and applauded, would he kill them, too? Or would the show be over?